In a previous article Java/Spring: Measure performance and time processing with AOP on server side, I have presented a solution in order to measure performance and time processing on server side via an AOP layer (AOPALLIANCE library in Spring framework) to measure the execution time of the methods in the persistence layer HIBERNATE. So in this article, I propose you to use an other AOP layer (AOPALLIANCE library in Spring framework) in order to caching data on server-side by intercept method calls and put their returns in a cache. Then, I will expose several solutions to invalidate the data cached: AOP layer, MBEAN/JCONSOLE, servlet/web service. This solution is more useful for data which don’t be modified frequently. To avoid the systematic calls to the persistence layer for data which change rarely, we will develop a system data cache on server-side with AOP layer to intercept and put in cache the calls to methods defined in the given beans. the JARs cglib-2.0.2.jar, commons-lang-2.0.jar, commons-logging-1.0.4.jar, commons-logging-1.1.1.jar, commons-pool-1.1.jar, commons-validator.jar (version 1.0.2), jnp-client.jar (version 4.2.3.GA), jstl.jar (version 1.1.2), mail.jar (version 1.3), spring-2.5.6.jar, spring-2.5.6.SR03.jar, spring-mock-1.2.7.jar, spring-webmvc-2.5.6.jar, spring-webmvc-2.5.6.SR03.jar and standard.jar (version 1.1.2). | MISE EN CACHE: mettre en cache le résultat des méthodes "methode1ToCache" et "method3" du bean ServiceToCache. * Contains the spring configuration. * Retrieve the spring bean corresponding to the given key. ServiceToCache: The calls to the methods method1ToCache and method3 of this class will be monitored by AOP in order to put in cache their returns. But its methods method2, save, delete, update and saveOrUpdate. * This method should wait 2 seconds and return the result. -> executes the intercepted method/business and compute the output, store it in the cache and return it. So, the class named Cache will contain the cached items and several methods to put/retrieve/remove/update an item in the cache and clean the cache. * Contains the cached items. * Put an item in the cache. * Retrieve an item from the Cache. * Update an item in the cache. * @return true if a cache refresh is needed for the given element. An other central class will be CacheInterceptor. 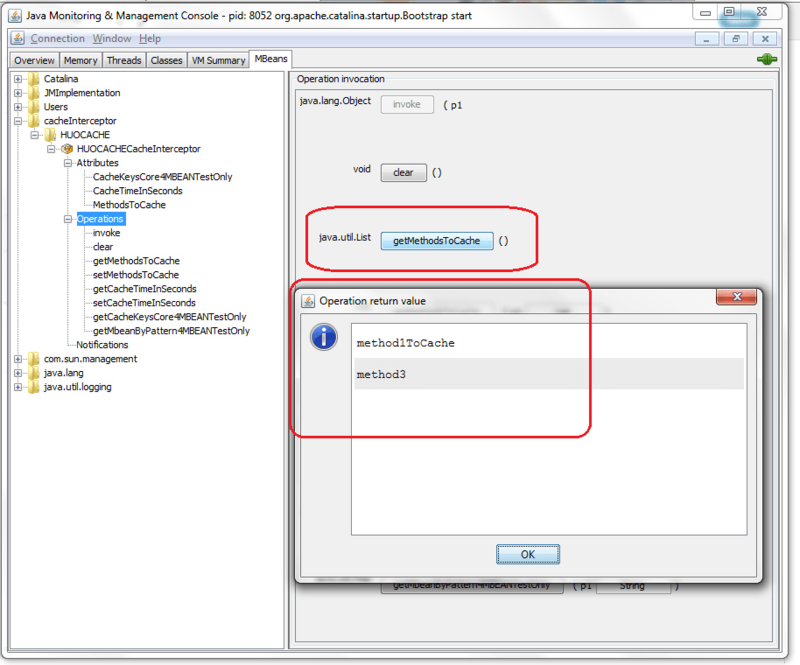 This component, implementing the MethodInterceptor interface of AOP, looks for the requested method output in the cache and returns it if found. If not found, it execute the requested method, cache the output and returns it. * Contains all the methods name to cache. * Contains all the cached outputs. * Time in seconds that returned object will stay active in the cache. * Erase all the items stored in the cache. * @return the key used to store the items in the cache. * Contains a reference to the spring context. … so, the outputs in console could be like below. 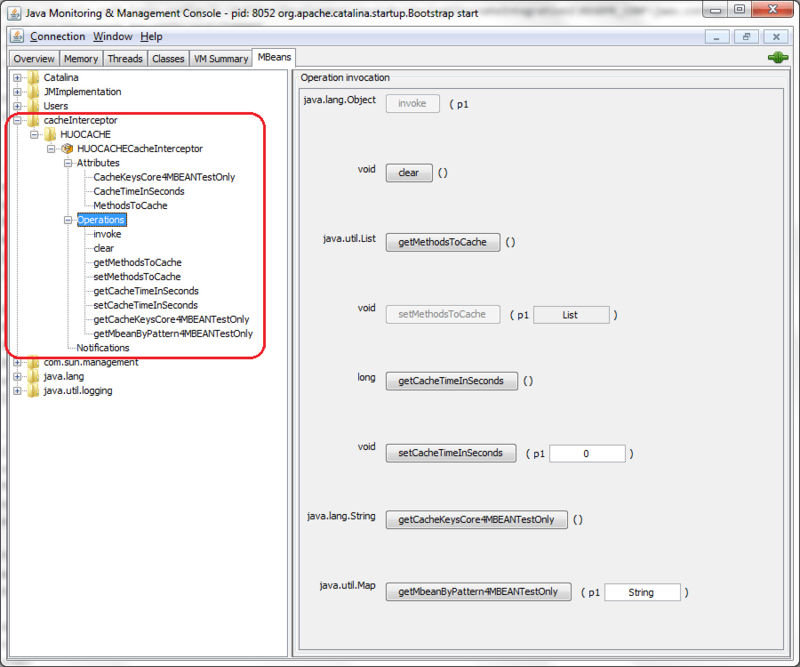 For more information, please, analyze the JUNIT CacheInterceptorTest and the bean to cache ServiceToCache . Here, I will expose several solutions to invalidate the data cached: AOP layer, MBEAN/JCONSOLE, servlet/web service. // Erase all the items stored in the cache. Manually: an other last solution to clear the cache manually via the use of MBEAN JMX. In the project in attachement, I will expose the CacheInterceptor Spring bean like MBEAN through the component CommonMbeanExporter (org.springframework.jmx.export.MBeanExporter), IRemoteMbeanService and MBeanVo. For more information, I advise you the post Quickly Exposing Spring Beans as JMX MBeans by Cris Holdorph about MBEAN exposing. INFO: Pre-instantiating singletons in org.springframework.beans.factory. 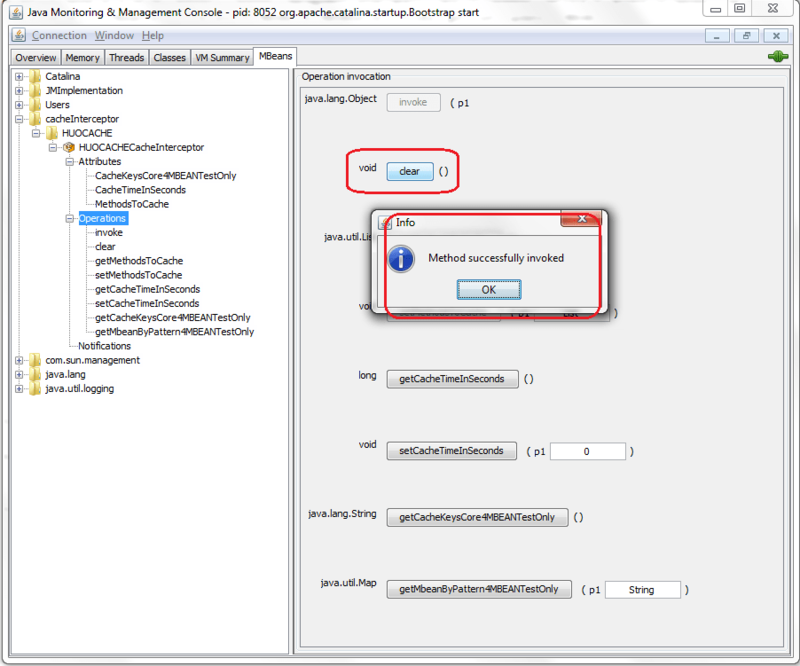 …we can access to defined MBEAN via JConsole . JConsole is a tool for following which is compliance with specification JMX (Java Management Extensions). JConsole uses the instrumentation of the JVM to provide information on performance and resource consumption of applications running on the Java platform. The JConsole executable is in JDK_HOME/bin with JDK_HOME equals to the installation path of JDK (C:\Program Files (x86)\Java\jdk1.6.0_32\bin). If the directory is in the Path environment variable, you can run JConsole by simply typing “JConsole” in the command line. Otherwise, you must type the full path of the executable. Finally, there is a class named MbeanTools which is not used in the attachement’s project, however thi class allows the access to MBEAN on a server SERVER1: [SERVER1 (management interface)] –RMI–> [SERVER2 (service of access to MBEANs from a tierce server)] –MbeanTools–> Access to MBEANs on MBEANServer (invoke, get, set, update ..MBEAN). there is also other solution of data caching like ECache. For more informations, you could contact me.